I was standing in the road near the start line of the Amgen Tour of California next to Darrell Parks, an incredible photographer working for Pez Cycling and Peloton who has become a friend to me and a smiling face at the tour. We were talking to Jamie, the humorous in-car announcer who drives the route of the Tour of California preceding the peloton to let fans out on the road know the situation coming at them. I have met Jamie every year, for six years. What I mean exactly is that I have introduced myself to Jamie six times anew. Now put into perspective that gathering at a race like the Amgen Tour of California is a reunion of sorts. Once or twice a year I get to see really cool, highly resistant, impressively energetic, honest yet positive folks who love the sport of cycling. We collect as a group to either administer or report on the race. We all know each other; from the officials to the marshals, motos, security, staff, photogs, journalists, key staff, team staff and me. We come from across the country and from overseas to do our best to present an excellent race in hopes that it will continue. So how is it that I am still introducing myself? Because it is normal. You see, I have this knack for remembering people. I can remember exactly where I met them, the entire setting behind them, and what we spoke of. I notice all the details and never forget a face or a story. Sometimes I embarrass myself by blurting out the location and details of our first meeting only to be met with a glazed response clearly indicating - I have no idea who you are. So this week when a fan wrote to me with the opening sentence "You probably don't remember me, but I was watching the Tour of California stage 1, here in San Diego with my Norwegian friends. 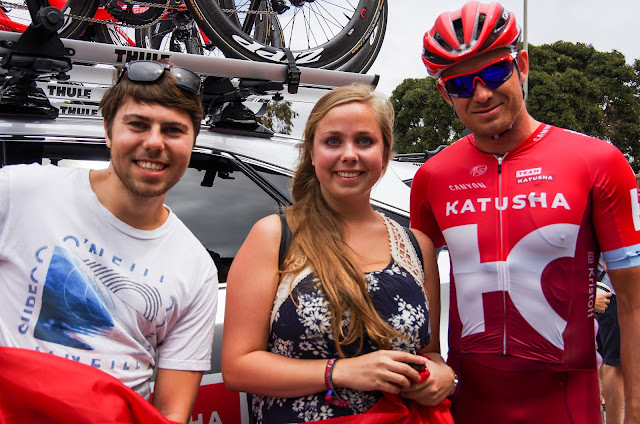 We met you when you photographed me, my friend and the rider Alexander Kristoff." Remember you - of course I remember you - you were a highlight of my day, I responded. And they truly were. You never know what will happen at a bike race. This is my creed, which not only applies to the battle on the road within and in front of the peloton, but to the experience of being a fan at the race. Just show up, give it your best and let the magic happen. 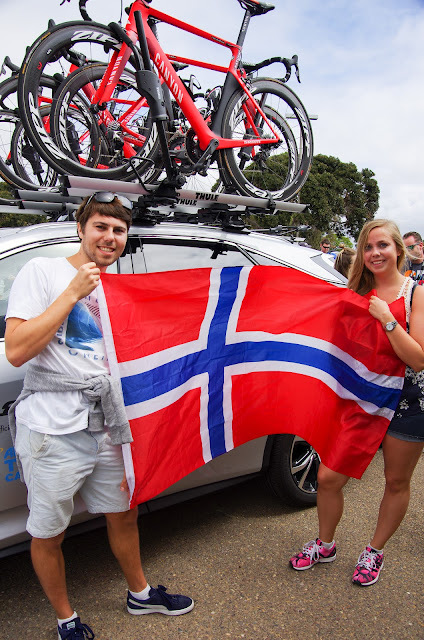 For the young students from Norway who brought their large red white and blue Norwegian flag to Stage 1 in San Diego, California, with the hopes of seeing their favorite rider, unplanned magic indeed happened. I had spotted the colorful photo op and approached them in a friendly manner. In utter excitement they explained to me, "We came because maybe we will get to see Kristoff, he is a really big deal in Norway." 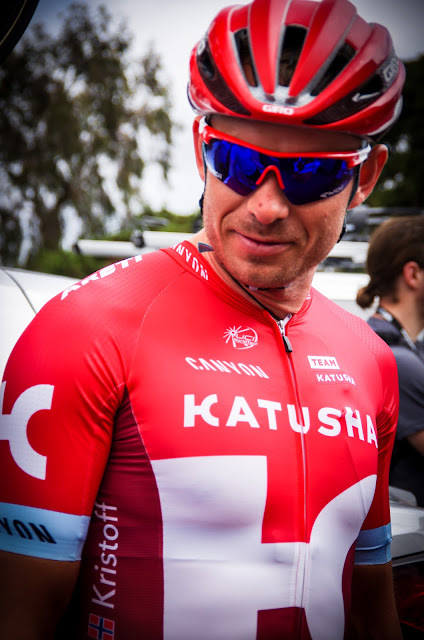 By the time they took a next breath, out of the Katusha team RV stepped Alexander Kristoff. "Hi I'm Alex," he proclaimed as if we did not know the man who was now standing two feet in front of us. What is the sound of dropped jaws and exhaling in utter amazement? Well that was all the three of us could muster as a response. Their dream was coming true and I was happy to be a part of it. There we were the four of us, me snapping pictures and them talking a language I hadn't heard in quite some time. Within two minutes every Norwegian speaking fan in San Diego had miraculously gathered around Alex. I could tell he was almost as amazed as me at the number of Norwegians now chatting away while swarming him for selfies. This week I sent Andreas, the young Norwegian student who had contacted me, ten photos taken of his minutes with Alexander Kristoff in San Diego. He responded, "There were so many nice pictures here, and this moment is something I will remember forever." After Alexander Kristoff stepped back into the team RV, the young Norwegian girl turned to me with her hand outstretched, showing me she was physically shaking from the surprising experience. Kristoff was indeed a big deal in Norway, but in that moment on the pavement of a parking lot near a watery bay in California, Kristoff had been a really big deal to two students studying far from home. People make a bike race, no matter where the memories are made and with whom. Whether I am meeting a new fan for the first time, an old friend, or reintroducing myself for the sixth time, all that matters is they made a special moment happen and they give me the courage to get out and make more. "this moment is something I will remember forever." The ability to make memories and win bike races - Alexander Kristoff, winner of yesterday's Stage 7 of the Amgen Tour of California. P.S. Thank you Darrell Parks for always remembering me!